Kills 99.9% of bin germs caused by nasty bacteria and residue and emanates a lemon fresh smell that continues to neutralise odours long after your first sprinkle. Kills 99.9% germs fast. Quickly absorbs & neutralises odours. Indoor & outdoor bin use. Clean clever.Fight Dirty to rapidly kill 99.9% of bin germs caused by nasty bacteria & residue. Enjoy the Lemon Fresh smell that continues to neutralise odours long after your first sprinkle. Application: Open pack. 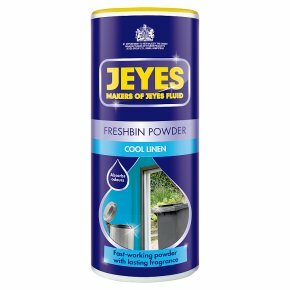 Sprinkle Jeyes Freshbin into the base of the bin, over bin sacks & directly onto refuse as required. N.B. Remove excess powder that has fallen through indoor bins onto carpets & other surfaces.